When I was thirteen, I was a quirky kid. I had a few kind friends from school and a few from church, but I mostly focused on my music for church (I played the piano each Sunday morning, Sunday night and Wednesday night) and loved to write songs. Days like today, (warm breezy spring afternoons), were enjoyable while growing up in southwest Iowa. When I wasn’t playing the piano, I was reading, praying, or lounging in a big hammock out by the oak tree as I stared up at the clear blue sky and white billowy clouds, day dreaming of what I would make of my life. On spring afternoons at middle school, I’d listen to people’s problems, pray with them, encourage them, and care about them. I’d invite kids home for lunch, for supper, and for church. After school, sipping ice tea and creating something grand were the things that I loved most. But I found something out about myself in those formative years … at times … I just needed a break from people. Too much mingling, listening, helping, and hanging out started to drain me. I thought to myself … it’s so weird! I loved people. I loved to help them, encourage them, pray for them, lead them to Christ, but somehow … I always get tired out! 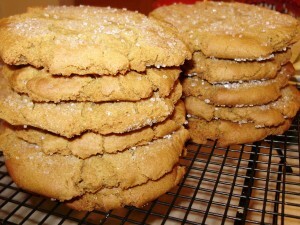 On those days, I remember specifically, I’d go to our kitchen, open up the old spiral bound Betty Crocker Cookie Cookbook, and turn to page 134 to find “Ginger Snaps.” For some unknown reason, baking those cookies, with the deep aromas of molasses, ginger and cloves, would make me feel energized once again. I found it calming and helpful to be away from people and do something that was just restorative to my spirit. Some thirty plus years later, I found that over the past week, I was feeling that same old exhaustion from people’s problems. The phone calls, the needs, the pain, the prayer, always makes me feel worthwhile in Christ and yet the aftermath is a deep feeling of depletion. When depletion sets in and we don’t try to face it with rest and rejuvenation, something bad happens to our minds and souls … we become resentful. After a ten day sprint of helping, I hadn’t had time for rest. I began to feel myself short fused, confused, and truthfully … minus any fuse! Resentment and a begrudging spirit surfaced and took front stage in my attitude. I got a good look at how I was acting and stopped short. Time for a good nap, with a yummy t-shirt and big cotton pajama pants, a tall glass of iced tea in the hammock and definitely time to pull out the cookie book. I grabbed the molasses jar with the bunny on the front, pulled my spices from the cupboard and begin to gently mix my batter. Dipping the delectable brown dough into sparkly white sugar and placing them on the cookie sheet started the process of settling and calming my spirit. My Bible is pulled off the shelf now as I recline back in my easy chair, munching on my cookies and sipping tea, while finding myself once again. Here’s the deal … if Jesus could take a minute, sip some tea, and bake some cookies, perhaps it may have helped calm His spirit. But, instead, He did the first and foremost important thing … He went away by Himself … He prayed. Today I’m off by myself and praying … and baking the cookies. Ooh … there they are, looking sugary, perfect, and delectable.